We walked section 17 of the LOOP nearly a month ago on August 17th. I've procrastinated on writing about this section for way too long, so hopefully my memory has not degraded too much. We started off in Cockfosters at the end of the Piccadilly Line and after turning on my GPS we headed straight into the woods to end up at Trent Park. We passed by a no longer used campus of Middlesex University, which was barely visible behind the trees. 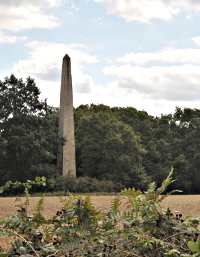 This part also featured an obelisk which we glimpsed after climbing up a steep hill into, and out of the forest. This location was apparently also used in a Doctor Who episode! After crossing Hadley Road, we continued past corn fields, where the corn was already harvested. After quite a bit more farm land, part of the Enfield Chase Estate we climbed up another short hill and through newly created Brooke Wood to get to the outskirts of of Enfield. We did not enter the town, but instead went north over a very nice new paved path, which continued onto an even nicer metalled path through woods and under a bridge with the Hertfordshire loop rail line going overhead. The nice path continued past friendly horses and green houses. Only a few of the green houses remained of a once vast area full of them. After following more paved paths we wandered into Hilly Fields park from where we started to hear music. First fairly soft but constantly swelling. We abandoned our original plan of having a pint and lunch at The Rose and Crown, apparently linked to the Gunpowder Plot, as it was way too loud in, and around the pub. Instead we continued onwards with Turkey Brook to our left, with the music slowly getting less loud over the next mile. We entered Forty Hall estate where we made a detour to have lunch at the nice green café. Nice it was, but the service was also incredibly slow. We did get our lemonade and cake fix sorted though. The section continued by crossing the foot bridge over the A10 to King's Lynn, and past the Enfield Crematorium. After a short section through Enfield, we finished the walk by going through Albany part. Crossing both the rail way and Turkey Brook took us to the end at Enfield Lock station. So, remember that I said at the start of this post "turned on my GPS" — well, I had. But it decided to not see the SD card, and hence not log to it ☹. I had to use my wife's inaccurate "Moves" data, run some extrapolations with gpsbabel, and do some other magic to geo-reference the photos that I took. Bah humbug. I am now making extra sure that the SD card is readable! The weather was mostly cloudy. It was warm at 20°C and not nearly as humid as we feared. I did not remember this at all, but handily, Wunderground has nice historical data available for August 16th, 2014. We took a little over three and a half hours for the 10 miles (16.5km).